In a note to investors seen by AppleInsider, Kuo has trimmed his prediction for iPhone sales in the first calendar quarter of 2019, Apple's second fiscal quarter, to between 38 million and 42 million units. This represents a reduction of between 8 million and 12 million units lower than the same period in 2018, equating to a drop of between 16 percent and 24 percent. TF International Securities' previous forecast for the period was between 47 million and 52 million units. Kuo writes there is to be lower-than-expected demand for the iPhone XR, with forecast demand estimates in the quarter revised down from 20 million to 25 million units to the new estimate of between 15 million and 20 million units. The increase in orders for older iPhone models is also recognized by Kuo, but it is advised the sales "cannot offset the decline of XR and XS series shipments because of the low season impact." While 2018 shipments are estimated to hit between 205 million and 210 million units, 2019 shipments are tipped to decline between 5 percent and 10 percent year-on-year to between 188 million and 194 million units. Kuo believes the lower-than-expected replacement demand is impacting the sales of the current-generation models. Furthermore, Kuo suspects iPhones shipping in the second half of 2019 are unlikely to increase sales, under the belief they will not include any "major upgrades." While shipments will be lower, Kuo believes revenue from iPhone sales could still grow in 2019 due to higher average selling prices (ASP), helping increase revenue year-on-year until the third quarter and offsetting the decline in shipments. The note continues one released in November by Kuo, which had cut iPhone XR shipments for the next year by 30 percent to 70 million in total, in part caused through the potential trade war between the United States and China, as well as consumers waiting for the iPhone XR feature set to become more affordable in another year. In October, Kuo offered predictions that the demand for the iPhone XR would be better than expected, with Apple producing around 38 million units for holiday sales and the model potentially defeating "low seasonality" after the holiday quarter. Kuo joins other analysts and firms who have cut their estimates and price targets in recent weeks, citing issues with iPhone saturation, a general slowdown of the smartphone market, iPhone demand in China, and the US-China tariff fight, among other reasons. Does this ever get old for analysts? Until Tim Cook says something other than what he said on the earnings call I do not believe any of this baloney. He got the numbers wrong last year iirc. I normally wouldn’t either but the fact that Apple is aggressively pushing their trade-in program and even increased trade-in values by $100 makes me think there might be something to these rumors. Nothing like this was on the front page of Apple’s website last year or any year before that. Maybe they’re all getting the supply chain completely wrong. Wouldn’t be the firs time. Or maybe consumers are balking at the higher prices. A couple years ago the flagship iPhone started at $649. Now it’s $999. That’s not nothing. He gets quite a few things wrong, so I have no idea why he's seen as some kind of prophet. Or maybe consumers are balking at the higher prices. A couple years ago the flagship iPhone started at $649. Now it’s $999. That’s not nothing. So what you're saying is, that the only phone that Apple sells costs $999, correct? Usual Reuter’s news Unreally !! Apple says the X[R] is their top seller, so I’m calling Ming a dingaling. Its definitely something. Also the old phones are fine. I have an 8, no reason to upgrade. If Apple produce something really good in iOS for the next generation of phones - it might force the upgrade cycle. Don't want to judge until Apple actually releases numbers, but this isn't hard to believe. Raising prices so much on the flagships like the X and XS can't help but turn some people off. It comes off as hubris and/or that they are trying to bring in LVMH type pricing for no other reason than they can. Cook defending the massive price hikes with "we want to have a price point for every one" was ridiculous. Subsequently releasing a cheaper, cut down version was only ever going to add insult to injury. Apple maintained price discipline on iPhones for years and years. They were able to charge a premium price and yet not alienate their base. It seems they might have lost that discipline and have decided there are not boundaries. Slowing unit sales, in that light, would simply be expected. LVMH doesn't try to sell more than anyone else, just to make more per unit than anyone else. We'll have to wait to see how well the Ahrendts-effect works out going forward. That’s not what he’s saying. He said the flagship iPhone’s price has risen $350 and it’s possible that consumers are balking on paying that much. That explains why IPhone 7 & 8 sales are higher than expected and XS and XR are lower. It also explains why Apple is offering more money for your trade in than they were a month ago. During a successful launch, your trade value goes down due to demand for the newer device. All groundless speculation, just like Kuo. You’ve assumed the worst with zero proof. How could you miss the obvious? Though I have a healthy degree of skepticism toward analysts projections, this one rings true for me. But I think it's not Apple's fault. Rather I think this is part of a much larger swing in the economy. With GM, and trade spats even with friendly counties, and budget deficits, and all sorts of things, I think a lot of people are frightened. Frightened people don't splurge on a $1k phone if the old one is still working. But then they also won't splurge on cars, or stereos, or expensive home furnishings. I suspect this will be a disappointing quarter for Apple, along with the rest of the economy. I've talked to a lot of people who are holding their wallets close, loved ones closer, and are just keeping it simple this year. Just because a company does marketing doesn't mean demand has fallen substantially. These price cuts might have been planned all along, just as Sony does with their mid high-end TV's: they always sell at full list when first released and then start dropping substantially about a month or two after release. For example, the 2018 X900F 65" has fallen from $2300 to $1800 and the X850F has fallen from $2000 to $1300. Prices will probably fall even further once the new models are announced at CES in January, even though they won't be available until much later in the year. There's nothing wrong with marketing to encourage even more people to trade in their old phones and upgrade by giving them a slightly better deal. One can argue that Apple is too greedy with their high margins. But I do think that Apple has overpriced the phones - not in terms of what they're worth based on the technology and design, but based upon what people are willing to pay. As I've written many times before, I think the very high salaries paid to Apple managers has completely warped their perception of what average people, even the high end of average people, can pay. Apple can't have it both ways: they can be a high-end, high cost niche producer or they can be a lower cost mass market producer, but they can't be both. They got away with it during the years that (U.S.) carriers subsidized the phones. Now that they're not, there is most definitely price sensitivity. The expectation that people who pay close to $1000 for a phone are going to upgrade every year or even every two years, especially as the technology has matured, is fantasyland. Just as Mac sales have tapered off, Apple is going to have to find another great product line to replace iPhone sales. Maybe they thought it would be AppleTV or the smart speaker, but those obviously aren't it. Apple is constantly hiring thousands of more employees. What the hell do they all do? Where are new product lines? Do they really need to build $ billion new facilities? We all have to pay for that via product pricing unless those new employees and facilities are going to generate revenue. Personally, if I was replacing my phone, it wouldn't be the Xr as I don't think there's enough of a functional increase. 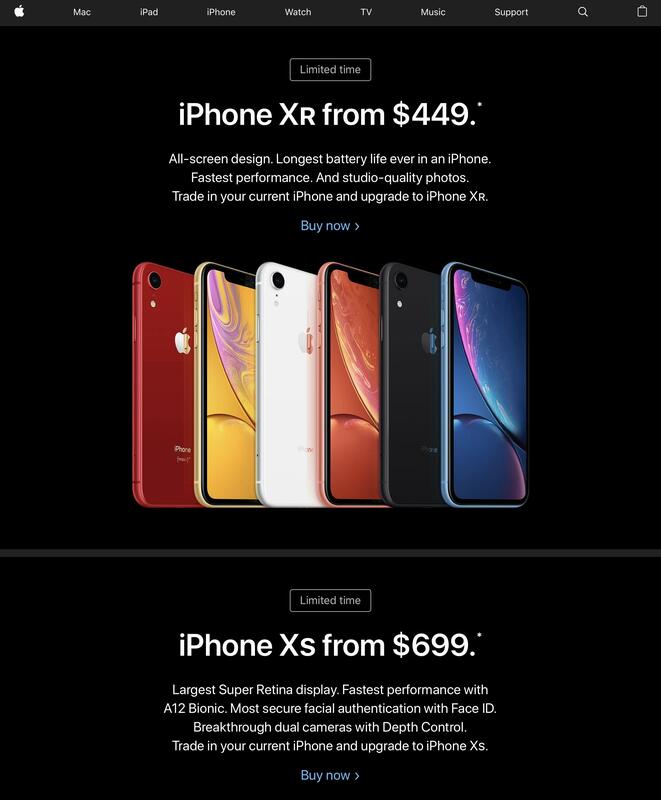 It would have to be the Xs with the better camera and frankly, I really don't feel like spending $1149 for the 256GB model when I spent $300 for my last iPhone. The reality is that most people use their phones to text, stream, get email, use Facebook and Instagram along with taking snapshots in which improved quality is certainly nice, but not a must have. Almost any phone released by any company in the last three years or so can do that quite effectively, as long as the screen isn't cracked and the battery will still last a day. If Apple only cares about revenue, they can keep doing what they're doing. If they care about units and market share, then the prices need to come down. Same for the Mac line, although I estimate from a revenue standpoint that Mac is only 10% of Apple now and Mac units declined from 19.3 million in 2017 to 18.2 million in 2018. I did a comparison at local Apple store. I would not buy the XR. It is bigger than XS but without many key features like dual camera, better resolution, more storage, better screen. lighter, etc. For $100 less, it is not a good buy. I like XR to be smaller than XS and sells for more than $100 than XS. Apple should use XR to expand market share. It will win buy with service revenues. Personal experience isn’t something that can be argued, however Apple has always made products for the price-insensitive and that hasn’t changed. I agree with him. You have to look at MAGA with empathy point of view. Consumers spend money a product always with a goodwill toward the company. But the President and his ultra right staffs put all kinds of bad words toward China. Even with unsubstantiated accusations like Bloomberg accuses Chinese security office of implanting chips. What will Chinese people feel of these accusations. But back to the truth, the ultra right wing white Americans really don't care. Their mind is very selfish. American is great. They want to restrict this to white people. They like to build a wall no matter what. Can US maintain greatness by isolating with the rest of world? If you think so, then explain why 1929 happened? Is it death by China? Or it is actually death by US? I just appreciate it when articles have reputable and refutable facts not just mostly opinions and speculations.